Contrasting the previous couple of months, August was a splendid month singles-wise. Conversely, real life wasn't as splendid with my inevitably slow march toward completion of my postgraduate dissertation. [insert antonym of fun here]. 15,000 words later, that chapter of my life is now over and I apologise for the hideously unpunctual production of this round up. Especially as this has maybe been the best month for singles this year. The singles bounty was so plentiful that I'm leaving out such stellar singles as Best Coast's 'Boyfriend' and 'Echoes' by Klaxons. I'm sure they won't mind. I should also mention the Entrepeneurs release that Jehan of the recently deceased Shattered Satellite blog has put out and old favourites of this blog Pull In Emergency's new single. But enough of that, ONWARDS. 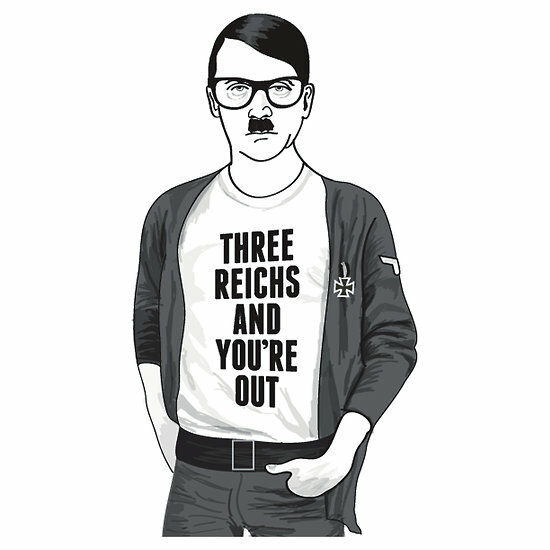 Oh, actually, one last note for Hipster Hitler, which I don't think quite hit the big time. Well, I didn't see anyone up in arms about it. Singles reviews after the jump. When I first heard 'Everything You Wanted', I wasn't even sure it would make it into the monthly round up. A couple of months later, and it's my current "go-to" anthem. And single of the month, no less. For all of Kele's other electro nonsense, he's hit a massive home run with this single. Melodic and majestic. You can't help but think that this could be Kele's ode to his fellow Bloc Party members while the band is on "hiatus". Not that he's the only (former?) Bloc Party to have been busy in August, with Gordon Moakes putting out a single with his band, Young Legionnaire on the noise-friendly Holy Roar record label. Taking the experimental indie thing I mentioned above in a different direction - 'Even Your Friend' is pretty much the musical equivalent of pick'n'mix, with particular highlights being the pseudo-rap bridge and the gospel vocal hook. "OHHHHHH YEAHHHHHHHHHH". Kind of like the soundtrack to the most ridiculous party ever. This band used to be called Pivot. I guess vowels aren't cool anymore. Maybe I should edit my name at the top of the page to "Sm Ds". Maybe not. Lucky for PVT, their music is inventive and exhilarating. Spearheading the current "experimental indie" movement along with Everything Everything. Marina steps up to the plate yet again with another slice of bombastic pop. And with more than a million views of the video on YouTube, she seems to have finally conquered the mainstream as she so richly deserves. In the thrall of Joy Division but all the better for it. Gloomy and pulsating. Love Ends Disaster! also offer up a remix which rather niftily sounds a bit like 65DaysOfStatic. It's weird how this taste of new material from Jimmy Eat World sounds like Linkin Park's recent stuff, but Linkin Park's new stuff doesn't really sound like Linkin Park. Good thing both singles are pretty good and encouraging signs for their respective new albums. This totally apes The Postal Service. But I thought 'Fireflies' was decent enough so that's not an issue for me. The song is apparently inspired by a film called 'Hannah Takes The Stairs', starring Greta Garwig, which was one of those mumblecore jobbies that I'm yet to experience. 'Waterfall' was released on the new Popjustice label which is sure to bring us more goodies in the future. This sounds like an inspired mash up of Robyn and The Sound Of Arrows. The video's a bit of an embarrassing cliché though. It seems like The Strange Death Of Liberal England have been around for an absolute AGE. 'Rising Sea' is a bit like what I'd imagine the sadly departed Hope Of The States would sound like these days. More empowering than melancholic but still those epic aspirations. The debut album is finally out now too. Alex Winston's been the talk of the town for a while now, since her covers of the likes of Mumford & Sons and Jack Penate. 'Choice Notes' is her debut single even though it was given away for free download in July. It is a wonderful song though, capturing the other-worldly magic of Joanna Newsom and the synth pop sensibilities of Passion Pit. Good month for singles right? What would Hipster Hitler say?